Yeah, yeah, two and a half months, I know. So where were we? I didn't mention it at the time, but our journey between Hamburg and Amsterdam was another Deutsche Bahn production. It could potentially have been a messy affair, with two changes of train at Munster and Oberhausen: but it all passed off with the efficiency we've come to expect from DB, and I even managed to get my laptop batteries recharged on the final leg's ICE train. The trainspotter in me hopes that our Amsterdam to Paris journey will be via Nederlandse Spoorwegen, just so we can say we've spent time on the national railway of every country we've visited. But no: we're on a Thalys train for four-and-a-bit hours instead. Apparently Thalys is some sort of rail Europudding, a collaboration between Belgian, French, Dutch and German railways. 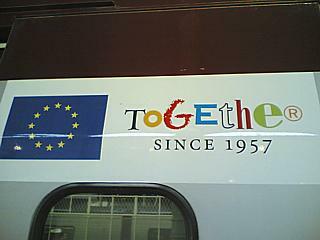 Their door stickers do at least remind us that we're undertaking this trip during the 50th year of the EU's existence. We try to pretend that this was the plan all along. Rachael's decided to give it a miss this time to pursue her career(s). Ken says he'd like to wait another year before doing it again. 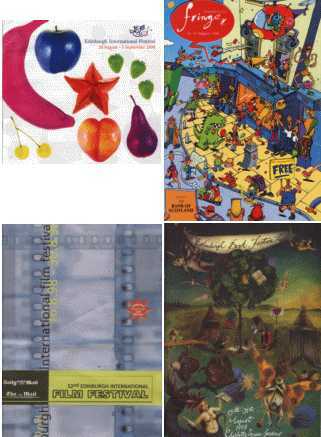 But the presence of Liz, Rob D, Sylvia, Rob G, Jon, Old Lag, Christine, Nick and Lesley means that apart from those two, all of Spank's Pals who were involved in the 1998 Edinburgh Festival visit are back for further punishment in 1999. You're all very brave. In addition, we also have a couple of new recruits joining the team: Charmian, a veteran of several Fests, and Grizelda, a first-timer who's followed through on her promise in the letters page this time twelve months ago. I know this is too late to be of any comfort to Quentin Tarantino and Robert Rodriguez, but I was rather looking forward to Grindhouse. After all, many of the films that ran for years in the grubby movie houses of New York's 42nd Street were the mainstay of Britain's video shops in the early eighties, before the Bright Bill clamped down on the nasties and took away all our fun. The idea of recreating a double bill from the golden age of cinema sleaze, complete with fake trailers and all, sounded rather appealing. 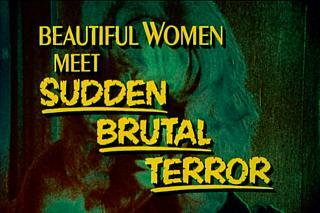 Unfortunately, American audiences disagreed, and the film died on its arse domestically. As a result, the rest of the world will only get to see Grindhouse in a re-edited form as two distinct features, making it virtually impossible for us to watch it in its original format. Which is a shame, because I suspect that'll mean the fake trailers will get lost along the way. Tarantino and Rodriguez obviously love these things, and even ran a competition at South by SouthWest inviting people to make their own. (If you only watch one trailer out of these two collections, then Hobo With A Shotgun has to be the one.) After bingeing on dozens of affectionate recreations, you start to wonder how neat it would be to have collections of real exploitation trailers available on DVD. Well, Synapse Films are way ahead of you: back in late 2005, they started releasing the 42nd Street Forever DVDs, each one containing over two hours of lovingly restored trailers for the sexiest, violentest and daftest films ever made. To date, three of these DVDs have been released: I can wholeheartedly recommend, er, two of them. 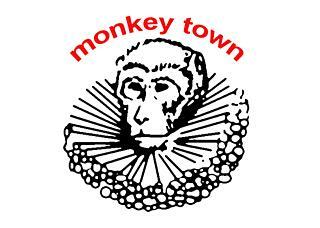 Originally posted on The Unpleasant Lair Of Spank The Monkey 30/08/1998. Yes, you're going to get all the rest of them in time for our 2007 Festival coverage, don't worry. So here's the deal. I was going up to Edinburgh with eleven other people (nine of them sharing student accommodation with me, two making other arrangements). 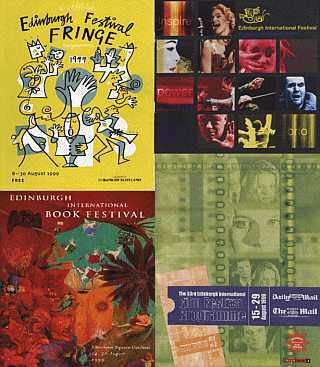 We would be there for a week at the height of Edinburgh Festival season: we'd timed it carefully to catch the highbrow delights of the main International Festival, the eclectic weirdness of the Fringe, assorted new and classic movies in the Film Festival, and the chance to schmooze with famous authors at the Book Festival. We were planning to see as many shows as humanly possible, and still leave enough time to get blind drunk in the gaps in between. And at some point each morning, I was going to drag my hungover unshaven carcass into the nearest cybercafe, type up a review of the previous day's events, and post it up on the Web for you ungrateful buggers. What were my chances of ever managing to pull that off? There may well be other posts in June - I'm thinking possibly a video review at least. But for now, we'll just take things as they come.